Xiaomi finally took the wraps off the new Mi A2 and Mi A2 Lite, the second generation of Android One phones by the Chinese company. The company held the launch event in Spain's Madrid and showcased their latest global smartphones. Xiaomi finally took the wraps off the new Mi A2 and Mi A2 Lite, the second generation of Android One phones by the Chinese company. The company held the launch event in Spain's Madrid and showcased their latest global smartphones. Both Mi A2 and Mi A2 Lite have been launched in China as Mi 6X and Redmi 6 Pro respectively. The new phones will focus on western and European markets. Android One's stock interface will be familiar to most consumers in these new markets. Xiaomi started the new series in India last year with the Mi A1 and later pushed out to other markets as well. Now, the new series plans on furthering the global reach of the line-up. Price: The Mi A2 is priced at 249 euros (roughly Rs 20,000) for the base model with 4GB RAM and 32GB internal storage. The 4GB RAM and 64GB internal storage variant is priced at 279 euros (roughly Rs 22,500). The most expensive device cost 349 euros (roughly Rs 28,100) with 6GB RAM and 128GB of internal storage. 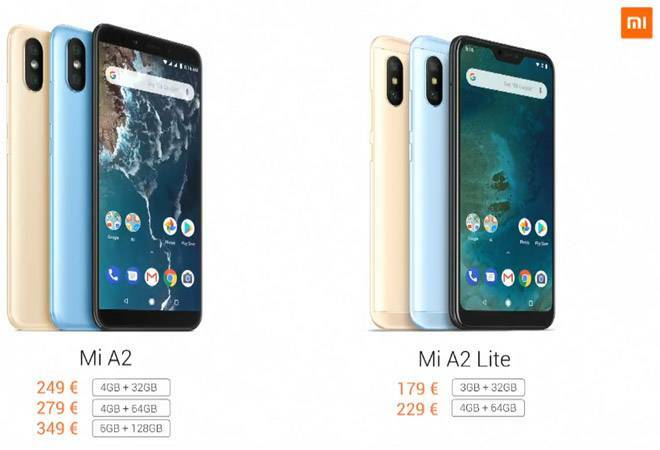 The MiA2 Lite is priced at 179 euros (roughly Rs 14,500)for the 3GB RAM 32GB storage and 229 euros (roughly Rs 18,500)with 4GB RAM and 64GB internal storage. Both devices will go on sale from August 10 in Spain. In France, the device will go on sale from July 27. In Italy, the Mi A2 and Mi A2 Lite will go on sale in August 8. Xiaomi also announced that the devices will soon be available in 40 countries very soon. India was among the list of countries that will receive the new Android One phones from Xiaomi. Both devices will be available in three colours: Blue, Black, and Gold. Android One- The new phones come with Android 8.1 Oreo out of the box and will also receive the Android P update later this year. The default photos app on the device provides unlimited high-quality photo storage. Google Lens will also come fully incorporated in the device. With the Android P, these two phones will get Google's Adaptive battery feature and the newest navigation system. Design- Xiaomi's new Android One offering comes with an 18:9 aspect ratio display. The 5.99-inch display is an IPS LCD panel with FullHD+ resolution. The display is covered with 2.5D Corning Gorilla Glass 3. The back panel is made of aluminum and comes in matte colour options. Body thickness measures in at 7.3mm. Power- The smartphone is powered by a Snapdragon 660 chipset and will be available in two RAM variants. The processor is coupled with Adreno 512 GPU. Camera- The camera comes with a dual lens setup with one 20megapixel sensor with other with a 12megapixel sensor. The aperture is large at f/1.75, which will help with low-light pictures. The 20megapixel sensor comes with something called SuperPixel which is 4-in-1 pixel for better sharpness. The front camera is also a 20megapixel sensor with large pixel size and aperture of f/2.2. The front camera uses AI for different modes. Despite being a single-lens setup at the front, the selfie camera supports bokeh effect. Design- The Mi A2 Lite has a more modern design with a notch on top. Though the device's bezel is not as thin as most displays with a notch, it does help provide some added screen real estate. The display is a 5.84-inch panel with a 19:9 aspect ratio. The phone will be available in Black, Blue, and Gold. Power: The device is powered by a Snapdragon 625 chip and will come coupled with either 3GB or 4GB RAM. The processor will be coupled with Adreno 506 GPU. Camera: Rear dual camera comes 1.2 ultra pixel size with both 12megapixel lens and the 5megapixel lens. The front camera is a single lens 5megapixel camera. The front facing camera uses AI to capture portraits with bokeh pictures.